SDGs should not be tackled in isolation given the many interactions and interdependencies across SDGs, and SDG14 is no exception. Given the expected growth of coastal settlements and megacities, various targets under SDG14 may be compromised unless housing, settlements and infrastructure are planned and managed sustainably. The Paris Agreement is a key hinge between SDG14 and SDG13, supporting and reinforcing the achievement of both SDGs. Most ocean activities and ocean impacts have their source on land, whether it is shipping and fishing activities or pollution and degradation of coastal and marine habitats. The International Council for Science launched a new report at the Multi-stakeholder Forum on Science Technology and Innovation for the SDGs (STI Forum, 15-16 May 2017, New York) titled, “A guide to SDG interactions: from science to implementation” (ICSU, 2017). The report highlights the importance of starting a conversation between science and policy on how SDGs can mutually support or may detract from one other, and the key role that integrated science and coherent policy-making have to play in the implementation of the SDGs, at both global and national level. As the international community prepares for the UN conference to support the implementation of SDG14 on oceans, seas and marine resources, we want to stress that the success of SDG14 will rely on and contribute to achieving the SDGs as a whole. ICSU together with the Institute for Advanced Sustainability Studies, the Cluster of Excellence “The Future Ocean” in Kiel and other partners will hold a side event on 5 June 2017 in New York to present the key findings of the report and discuss next steps for making progress on meeting SDG14. Last year, Nilsson et al. 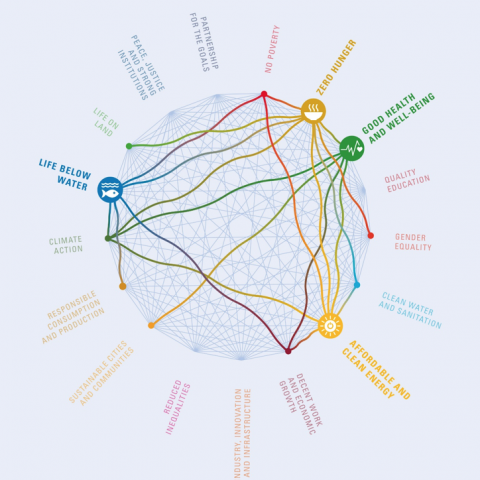 (2016) proposed a pragmatic approach to mapping SDG interactions based on a seven-point scale for scoring the level of interdependence between two goals or two targets. The scale ranges from +3, which applies when one goal or target is very reinforcing of others, to -3, which applies when goals and targets are mutually excluding. This initial framework has now been expanded into a comprehensive report that examines four goals (SDG2, SDG3, SDG7, and SDG14) in more detail, along with their underlying 36 targets. First and foremost, SDGs should not be tackled in isolation given the many interactions and interdependencies across SDGs, and SDG14 is no exception. Actions in one SDG area have multiple ripple effects, synergistic as well as conflicting ones, across many other SDGs that need to be accounted for to ensure efficient and effective implementation. Oceans fundamentally underpin human development and well-being. Achieving healthy, resilient oceans and the sustainable use of their resources are critical for humanity and will contribute significantly to the realization of other SDGs fostering basic human needs and development, including poverty eradication (SDG1), and in particular for coastal communities, access to sufficient, safe and nutritious food (SDG2) and sustainable economic growth (SDG8). The successful achievement of SDG14 will also heavily depend on the achievement of other SDGs including SDG11 on sustainable urbanization. Given the expected growth of coastal settlements and megacities, various targets under SDG14 may be compromised unless housing, settlements and infrastructure are planned and managed sustainably and through integrated and coherent policies. Similarly, whether SDG12 on sustainable consumption and production is achieved or not will have a major impact on the oceans, seas and coasts. Sustainable consumption and production patterns will be fundamental for decoupling the input of marine litter to the ocean from economic growth. The oceans face multiple and growing threats as a result of climate change and development trajectories that are not sustainable. The two SDGs on climate (SDG13) and oceans (SDG14) are highly synergistic, but particular attention is needed to ensure that climate adaptation, and coastal and marine protection, do not conflict. As the Paris Agreement emphasizes, the integrity of all ecosystems including the oceans is essential for combatting climate change. Coastal ecosystems are part of the solution for both climate mitigation and adaptation, for example through mangroves acting both as a blue carbon sink and providing natural coastal protection. In fact, the Paris Agreement is a key hinge between SDG14 and SDG13, supporting and reinforcing the achievement of both SDGs. Put more emphasis on understanding and managing the interface between land and oceans. Most ocean activities and ocean impacts have their source on land, whether it is shipping and fishing activities or pollution and degradation of coastal and marine habitats. Achieving SDG14 therefore requires the strengthening of integrated research to provide a basis for decision-making, and strengthening of coherent and integrated governance frameworks across geographical and jurisdictional scales to better deal with transboundary issues (such as pollution). Interactions between SDGs are both generic and contextual. Particular geographical or political situations, cultural or historical contexts may generate specific interlinkages and modify the strength, nature and direction of interactions. The scoring approach provides a common terminology for experts from different disciplines and sectors to gather relevant information, assess interactions and learn from each other, and importantly, for policy-makers to map interactions across policy domains to support a whole-of-government approach to implementing the SDGs. Interactions should not become another buzzword to hide behind but a concrete tool for defining win-win strategies for achieving the SDGs. Understanding and tackling the systemic character of the 2030 Agenda and the 17 SDGs is key to achieving SDG14 and strengthening global and regional ocean governance. Fig. : SDG interactions analyzed in-depth in the ICSU report (ICSU, 2017) using a seven-point rating scale and based on reviews of scientific findings and expert knowledge. Schmidt, S., B. Neumann, Y. Waweru, C. Durussel, S. Unger & M. Visbeck. 2017. SDG14 Conserve and sustainably use the oceans, seas and marine resources for sustainable development. In: A Guide to SDG Interactions: from Science to Implementation. D. J. Griggs, M. Nilsson, A.-S. Stevance and D. McCollum. Paris, International Council for Science: 174-218.